I finally had a chance to take a break from being a SAHD. 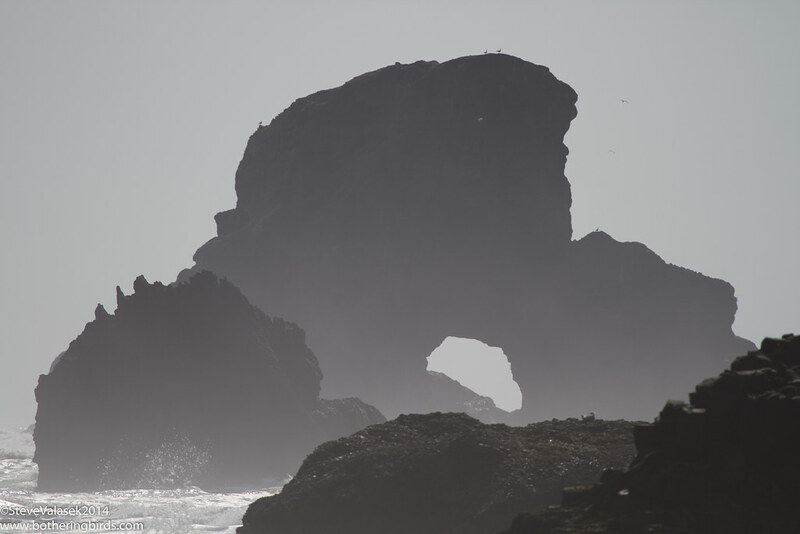 I've been seeing posts on the listserv about this magical place called Yaquina Bay in Newport Oregon. So many awesome birds were being reported that I've just heard about or seen in books. So the stars aligned and I was able to get down there for 2 days and a night. Alone. With no kids. I love them, but no sane person can be expected to put up with 2 pre-schoolers 24/7. I rented a car and set off from Beaverton in the pouring rain and hoped for better weather at the coast. But I stopped by REI on the way to pick-up a longer rain coat than the one that I had. This simple stop turned into an ordeal which put me behind 2 hours, but I was happy with the final product (it's this jacket). Which, as my luck would have it, and which I planned for, I barely needed. 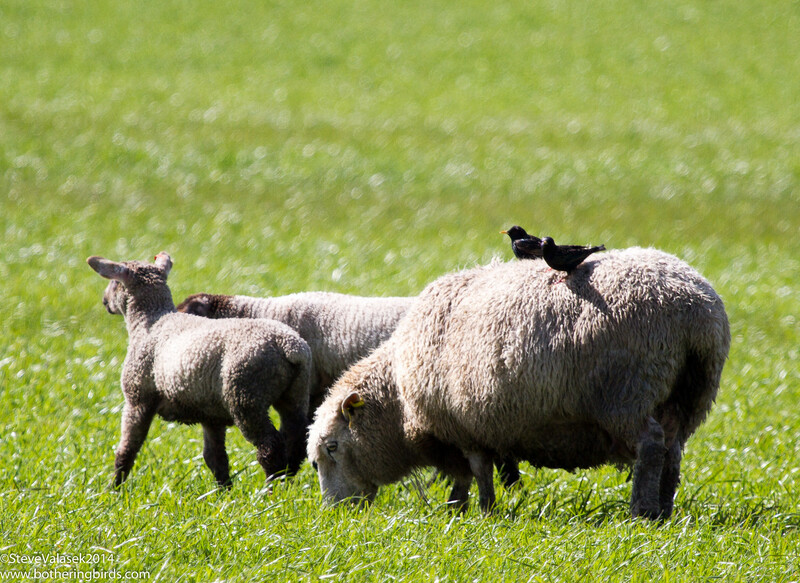 On the way there I got a break in the rain and was looking at some spring lambs along the road when I saw something that I had to stop and photograph. Some sheep were attracting some odd accessories. I got down to Newport in time to walk out along the south jetty. I would end up with 8 lifers on this walk alone. 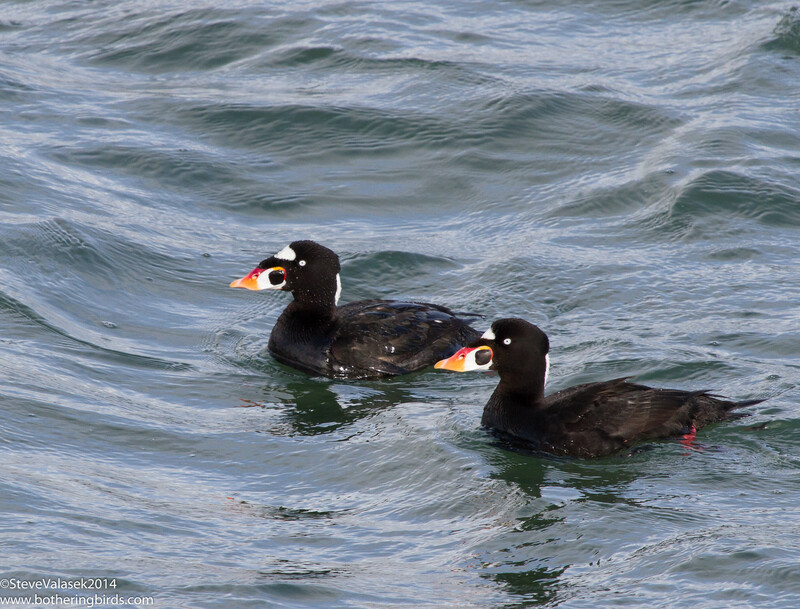 First off was a Mew Gull and then I saw some odd looking ducks with white patches on their heads, Surf Scoters. 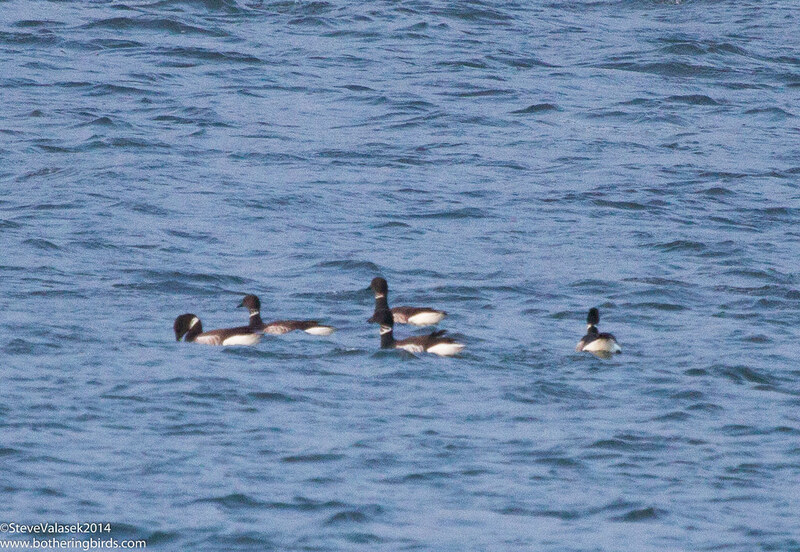 There were lots and lots of Greater and Lesser Scaups under the big bridge, but in with them were some Buffleheads and then I noticed a Barrow's Goldeneye male with some females. I walked west along the jetty facing the setting Sun. I noticed a seawall (?) sticking out from the jetty with some odd, soft looking rocks at the far end. 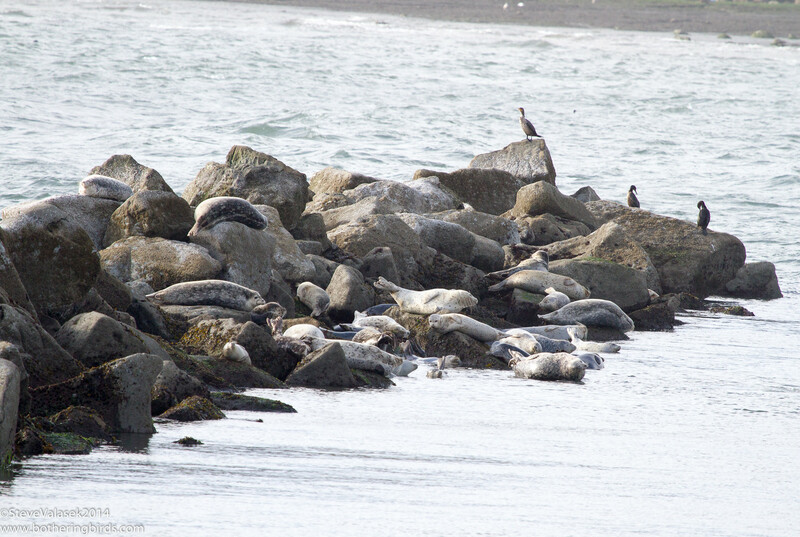 Seals! And some Cormorants were hanging out. I was really looking for Brown Pelicans, but there were none about on Saturday. Further up this same pile of rocks were some Gulls and some really young ones were in the water checking out some Sea Stars. 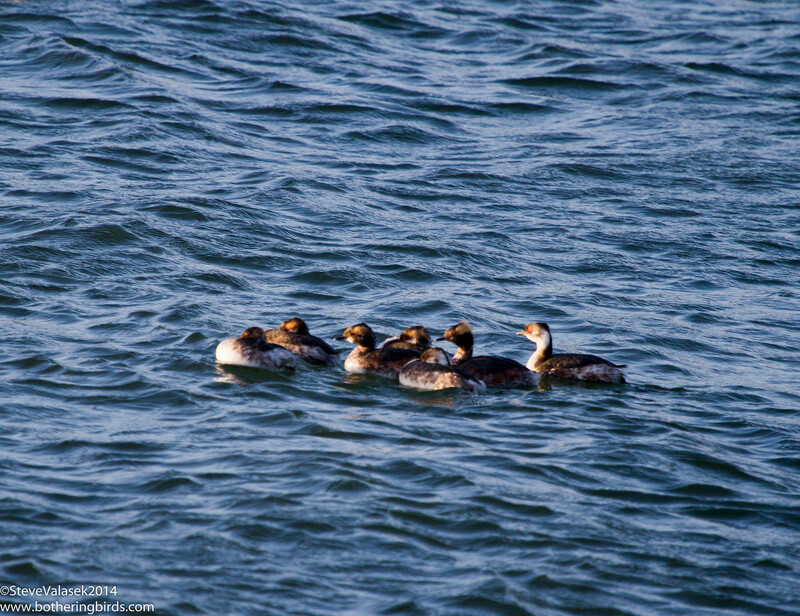 There were lots of Grebes around too. 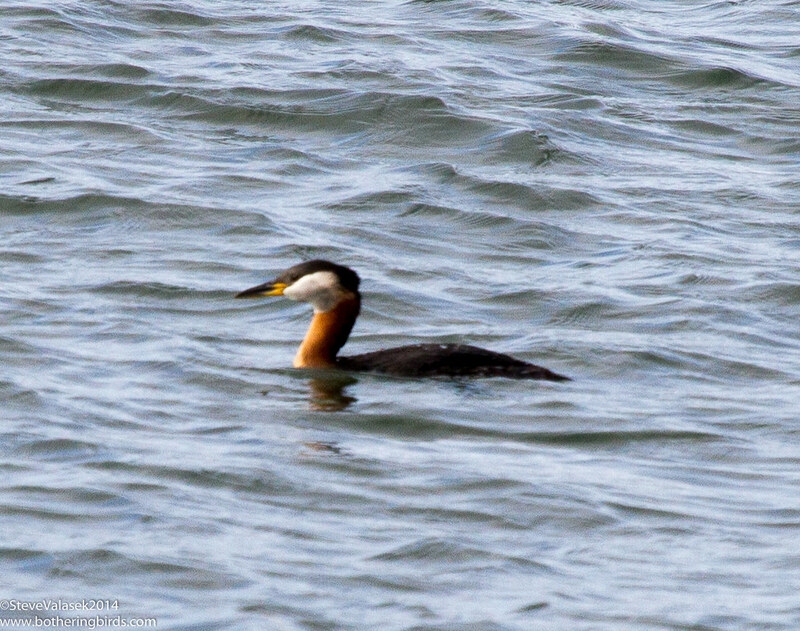 I saw a dozen or more Western Grebes, which I scanned hoping for a Clark's to no avail. But I did notice this Red-Necked Grebe a little ways out. And there were some Horned Grebes too, a small raft of them. 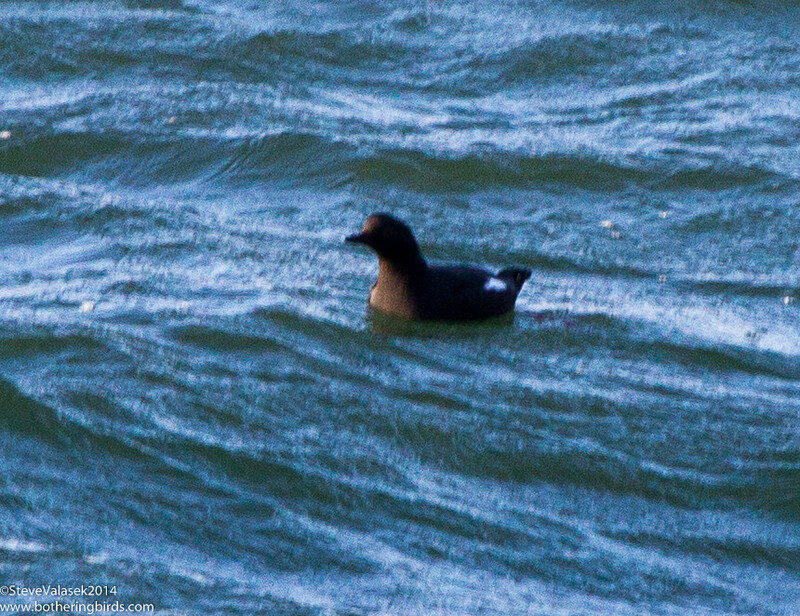 Besides the Surf Scoters, I saw a single Black Scoter amid the Scaups and a few of these White-Winged Scoters. 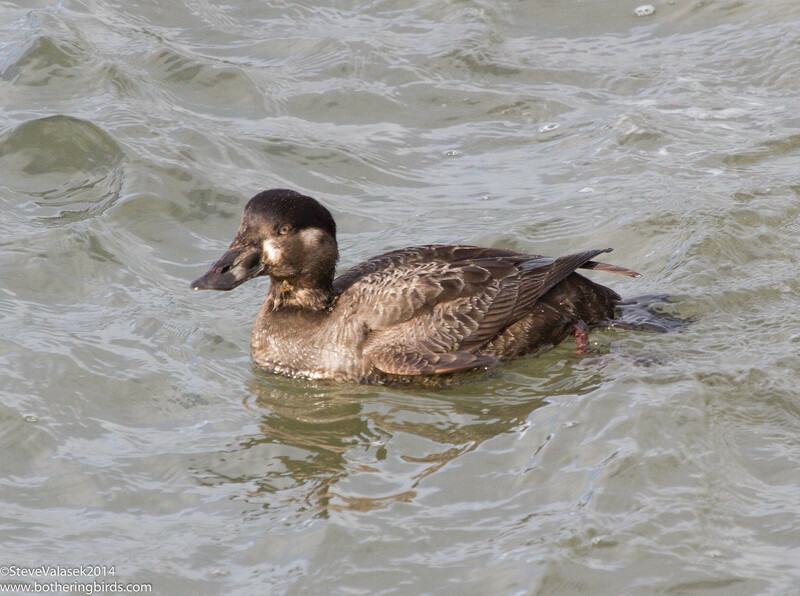 Apparently, this is a female Surf Scoter, not a WWSC. Perhaps I never saw a WWSC on this trip, I don't seem to have any photos of one, other than this. 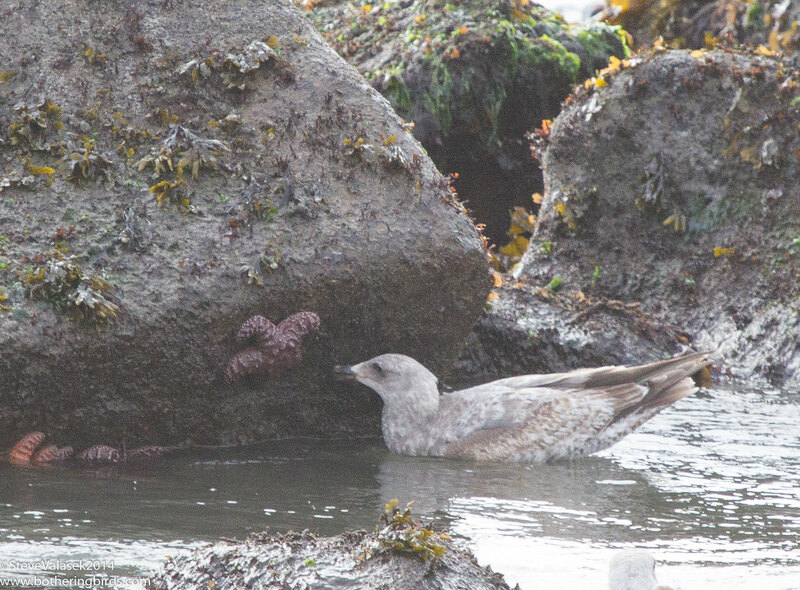 I didn't walk all the way to the end of the Jetty, but part of the way out I saw a small black bird with some white spots on the wings, a Pigeon Guillemot! 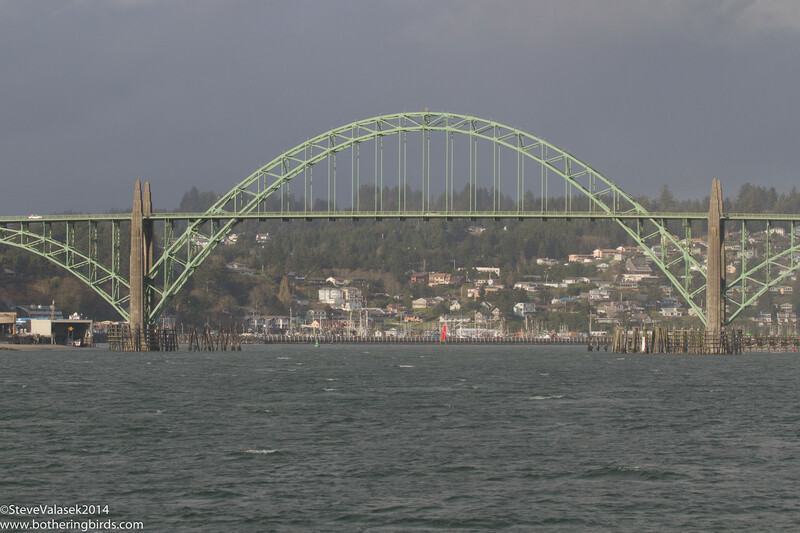 Turning back towards land, my hotel and the Rogue Brewery, I got a really nice look at Newport and the bridge. 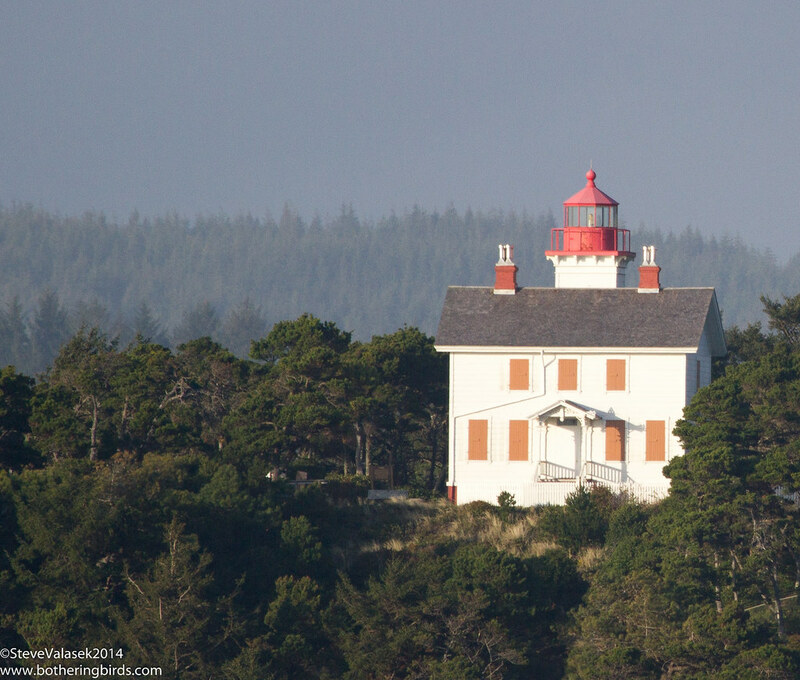 And of the Yaquina Bay Lighthouse north of the bridge. Still scanning for birds on the waterway I saw an odd shape floating there, it was a merdog! 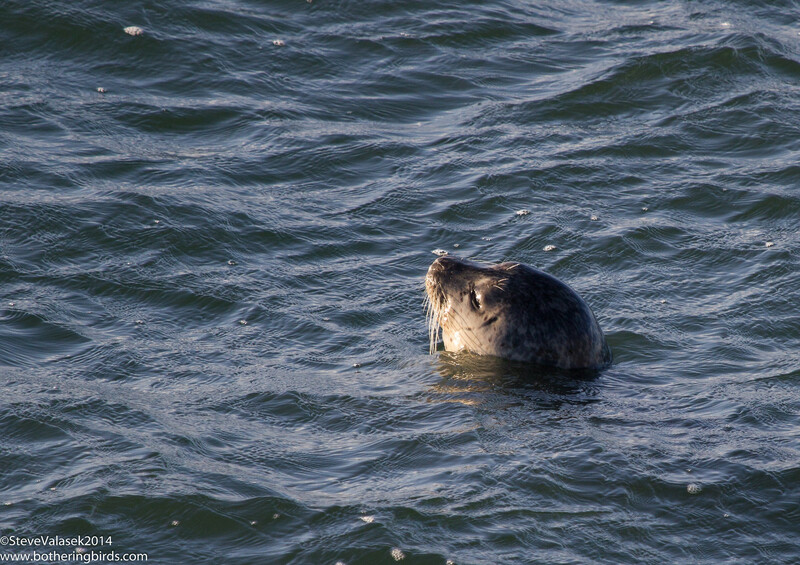 Ok, it was a Seal, but think about it. 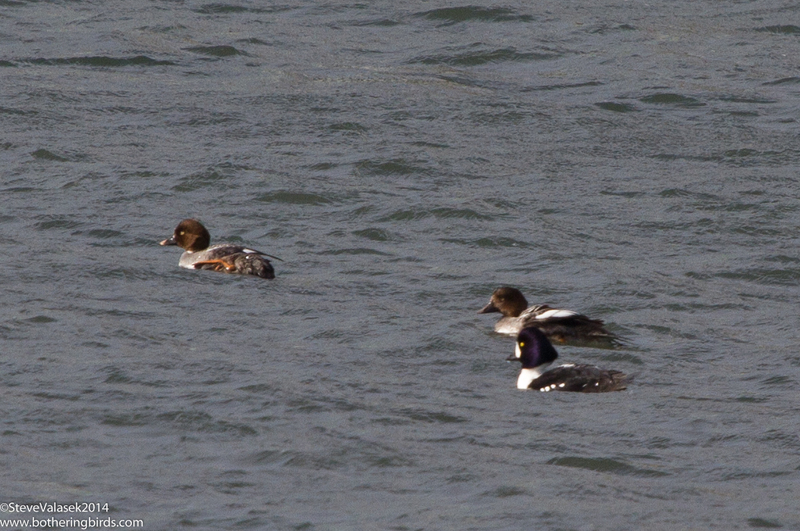 I was almost back at my starting point under the bridge and the collection of Scaups and Buffleheads had grown. And off to the side were some small geese, a little group of Brants, what a nice surprise. If you read my old blog, you may remember me chasing a solitary Brant around Albuquerque, but here they were in their usual range. 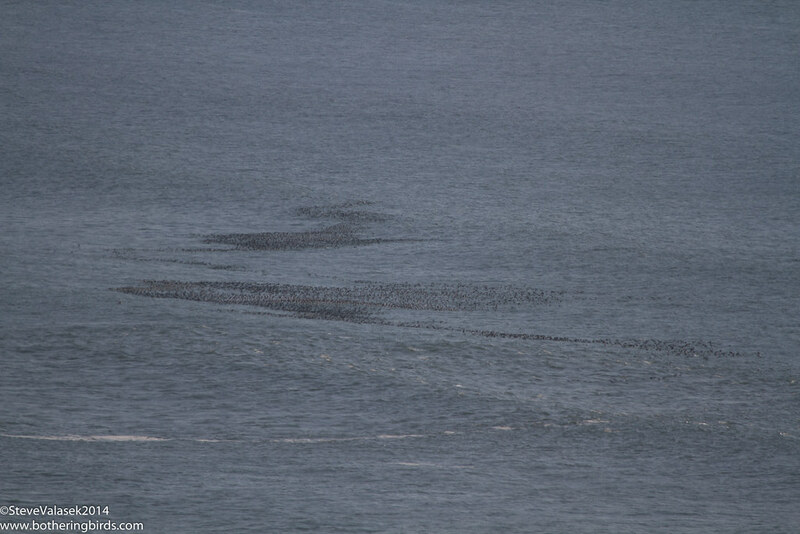 And they appeared to all be Black Brants too. That was it for the end of my first day in Newport. I took my camera and binoculars back to the hotel and walked over to the Rogue Brewery and restaurant just next door. I had an okay veggie burger and a delicious Irish Lager for dinner, which I liked so much that I brought some back home. The scale of the place was amazing, but that's for a different blog. Not much has been going on for me in Oregon regarding birds. The weather turned rainy this week and the family has been keeping me busy. We've also been looking at places in Ireland and doing lots of research about Dublin and the surrounding areas. But I have been out off and on over the last couple of weeks. I went looking for a Northern Shrike a couple of weeks ago, but dipped on that bird. And then last Saturday I spent a bit less than 2 hours looking for a Tufted Duck on the Columbia River, which I also dipped on. But I did manage to see some interesting birds here and there. My son and I went down to Tualatin River NWR a few weeks ago looking for said Northern Shrike. He ended up being a big pain in the neck, so we didn't get to explore too much. But we did see some nice songbirds out and about. 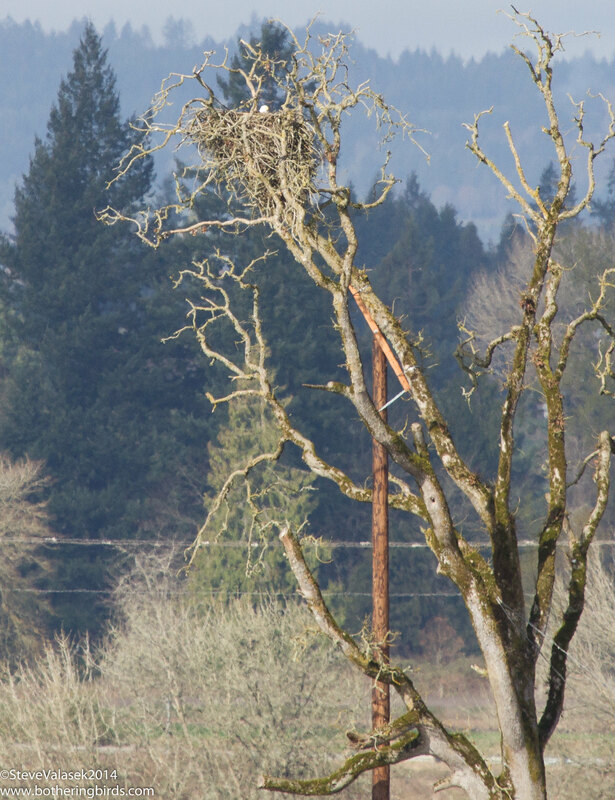 There were a pair of Bald Eagles on the refuge and the female was already on her nest. You can just see her head poking out at the top-center. One evening I went back out to the west of Hillsboro looking for a Short-Eared Owl which has been seen at dusk very regularly. I got my directions a little bit mixed up, but when I finally found the spot where the owl had been seen I almost drove past it. It was sitting on a road sign not more than 20 feet in front of my van, and when I stopped to get a look at it, it flew off towards some houses. I followed it and saw it land on a tree top and I did get one, very poor, photo of it. Last Sunday morning I went out to the Columbia River to try and see a Tufted Duck that was reported among a few hundred Greater and Lesser Scaup. This was a duck reported on the national rare bird alert, so I wanted to get it for my ABA list. But it would turn out to be a really tough bird to find. 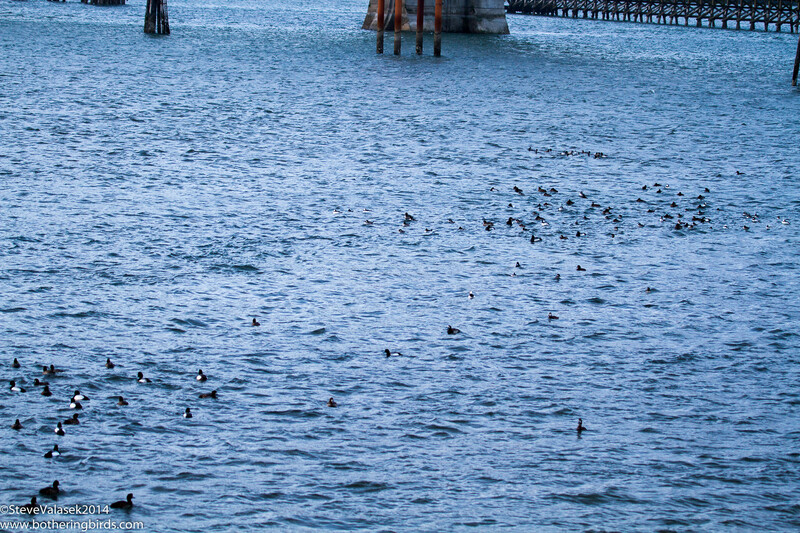 As you can see in the above photo, there were lots of ducks on the river. This is maybe 10% of what was there. Add that some were on the far side of the river, they were constantly flying upstream and floating back down, and that the rising sun was giving them all dark backs (the best field mark to tell them apart from a Scaup) and it was near impossible for me and I gave up. I certainly tip my hat to the finders of it. Later that day my family went out to the coast for a visit. We went to Cannon Beach with the goal of trying to spot some migrating Gray Whales, but ended up dipping on those. But we had a great time playing in the sand. I didn't get a chance to look at too many birds, but I am planning another trip to the coast soon. But we did see some great sights. I have no idea what these are, but we were fairly far up the cliffs when I spotted them. 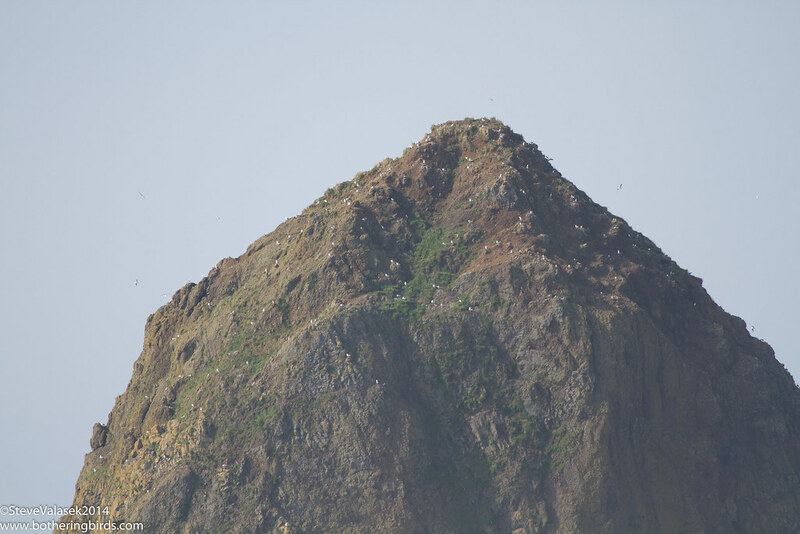 We also got to see Haystack Rock, which will be a nesting place for Puffins and other seabirds soon. It's on my list of places to return too in a few weeks. And a few days ago I was driving through Beaverton after getting my son a new-to-us bike, I spotted some birds in a small roadside wetlands. I found a place to park while he was sleeping and saw a nice little assortment of ducks geese. I saw some Eared Grebes in their breeding plumage and spotted a Cackling Goose with a band around it's neck. I didn't have my camera, but I made a return trip later that day with it. The Grebes were gone, but the goose was still there. The I reported the band through the appropriate website and actually received a letter of appreciation. 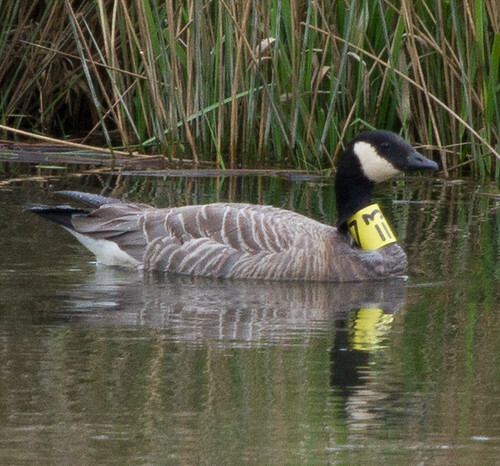 The bird was banded in Alaska last year and is probably heading back that way now. Although it being by itself may not a be a good sign. There were some other nice birds about. 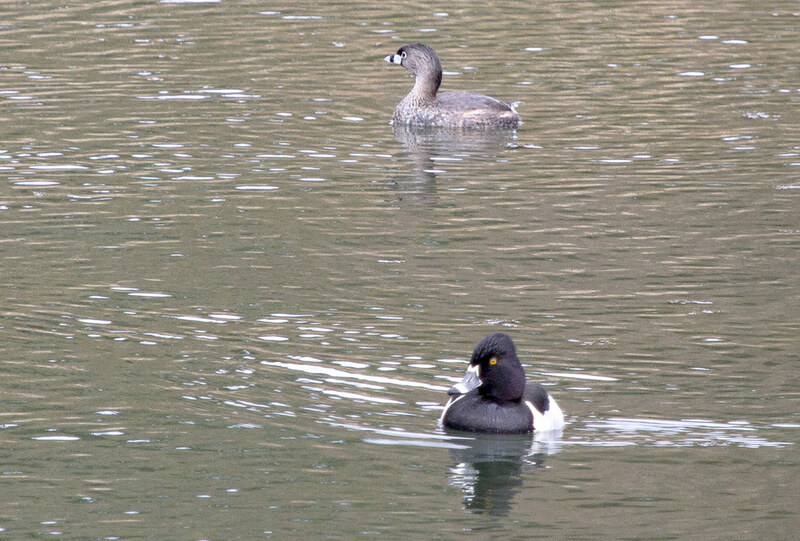 A Pied-Billed Grebe in breeding colors was swimming near a lone Ring-Necked Duck. We have a small hummingbird feeder on our apartment's porch. It is very popular and I need to fill it every day. Despite the fact that it never gets good light for photos, I thought that I'd try anyway. 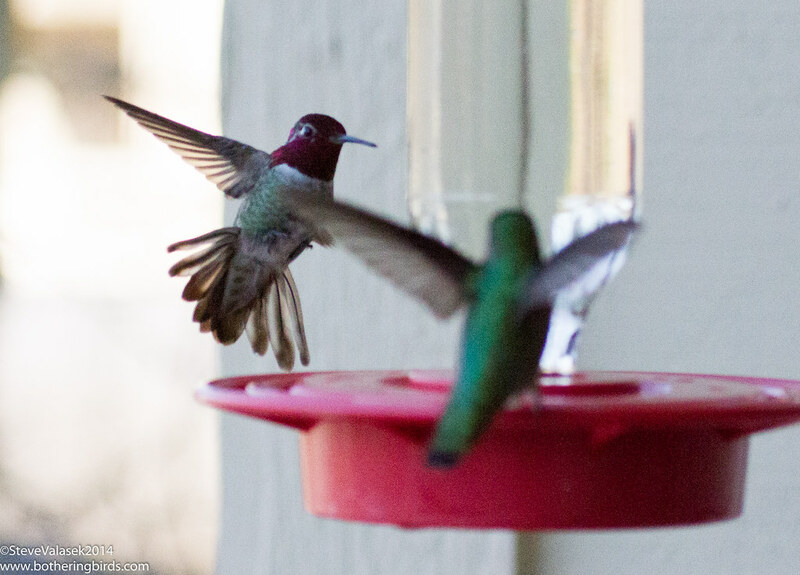 Here's a couple of the better shots of Anna's Hummingbirds. We had a Rufous for one day and then it moved on. Hopefully I get some nice photos of a male before I leave. It's odd to think that I won't be seeing any hummingbirds for a few years while we're in Ireland. So nothing too exciting. I'm heading to the coast either this weekend or next and could see my 300th bird there, if the weather cooperates. 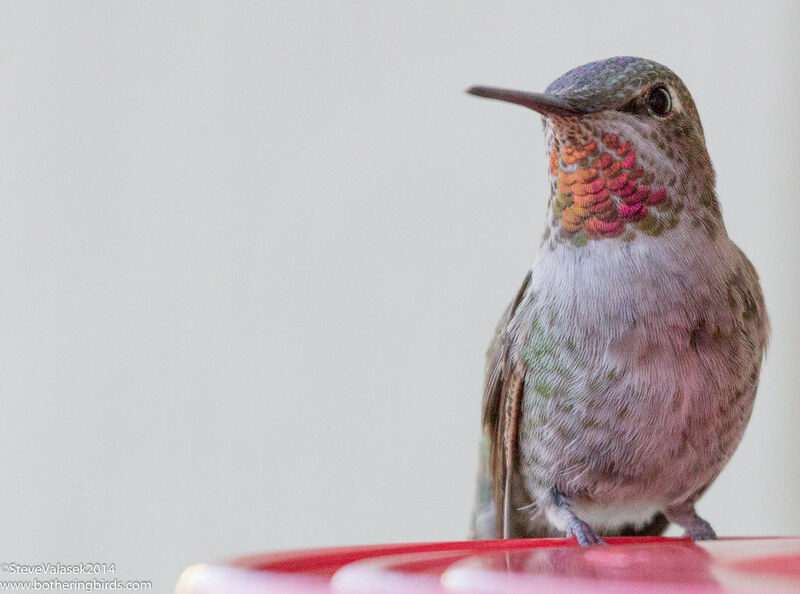 I moved my hummingbird feeder down so that I can take some photos of them when they visit. But they couldn't wait for me to get out of the way, this was taken with my cellphone an arm's length away. 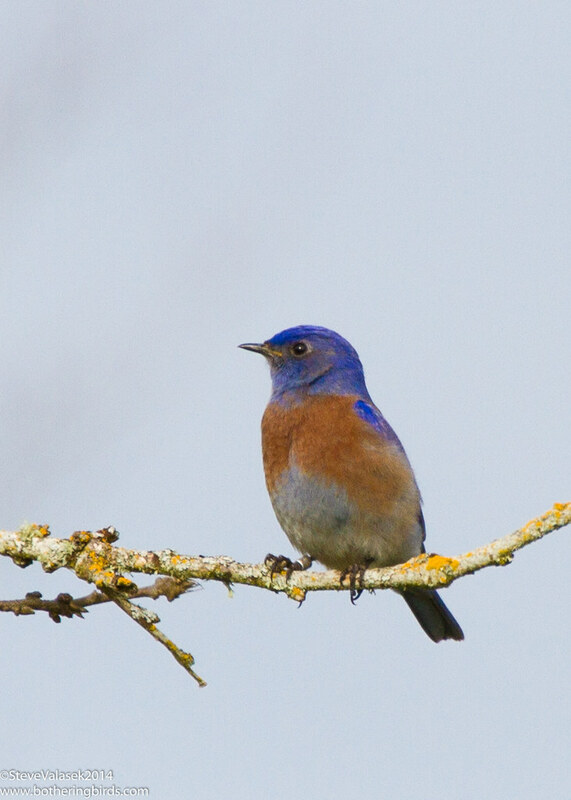 I went out and joined the Portland Audubon Society walk on Sauvie Island yesterday, March 15th. This was my first real bird walk in Portland and I was looking forward to seeing Sauvie Island and what was up there. I met the group, which turned out to be a big one, and we got started. The target were sparrows. Sometimes up to 8 different species (not counting Towhees) could be found along the road which we would hike. This area actually offered some varied habitat in a short distance, open fields, flooded fields, streams and woodlots were all found. And thick blackberry plants lined the road. Sparrows were the goal, and sparrows we saw. The most plentiful were Golden-Crowned Warblers. I think back to November and being so excited to see a single one at Bosque del Apache, and here I am tripping over them in Oregon. We also saw some Song Sparrows, Fox Sparrows (Sooty type), Savannah Sparrows, White-Crowned and White-Throated Sparrows. And I was lucky enough to spot the sole Lincoln's Sparrow of the day, which gave us 7 total. No Vesper, Lark or Brewer's were lucky enough to be along the road that morning. We saw many, many Bald Eagles. By the end of the day I would see almost twice as many as Red-Tailed Hawks even. The first birds that we saw were a pair of Bald Eagles doing some courting by synchronized flying. This immature Bald Eagle was out over some flooded fields looking to bother some ducks. We even managed to see some shorebirds, although I would miss a Snipe which some people in the group had seen fly off, and some of them would lead to a large debate on identity. These small sandpipers caused quite the stir, they were first ID'd as Least Sandpipers, but then some other people felt that their legs weren't exactly yellow. Then we went down the list and settled on Dunlin in non-breeding plumage. The field marks to settle the debate came down to leg color and very clean under-wings when they shortly flew off to another part of the fields. Either way they were lifers for me. One thing that I really need work on, besides gulls, are shorebirds. Especially now that I live near much more variety than I had in New Mexico. At the end of the list we tallied up the group totals and they counted 64 or so species, my list was 45. There were birds that I missed, and some of the group were there early enough to hear Owls and do a bit of extra birding. But that was really a good day for me, and it was barely morning. Most of the group went up to look at deep water along the river and saw some gulls, a tree full of Cormorants, another Bald Eagle, some Common Mergansers and a Greater Scaup. After the quick stop, we drove to a roadside viewing platform to see a few hundred Snow Geese hanging out, which included a couple of the Blue Goose type. We also watched some recently returned Tree Swallows flying around some nest boxes, and these 2 sat still long enough for a decent photo. And even more Bald Eagles were about. We counted 3 Immatures in the same tree and got to watch one try really hard to catch a Cackling Goose. We watched the eagle try a few times to grab the goose after it sat on the water, but every time the Eagle got close, the goose dove under the water! I tried to make a GIF from some images, but I think that I missed a shot or 2, but here it is anyway. This happened 3 or 5 times before the Eagle gave up and flew to a tree to rest up. The scene from the observation tower reminded me again of Bosque del Apache, lots of different birds on the ground with an Eagle over-head bothering everyone. Sitting in my car after leaving the observation deck, I realized that I had quite the list of birds already that day, over 50 by this point. I wasn't sure what my person best for a day was, but I knew that it wasn't above 65. So I decided to give a half-hearted shot at seeing how many more I can get that day. 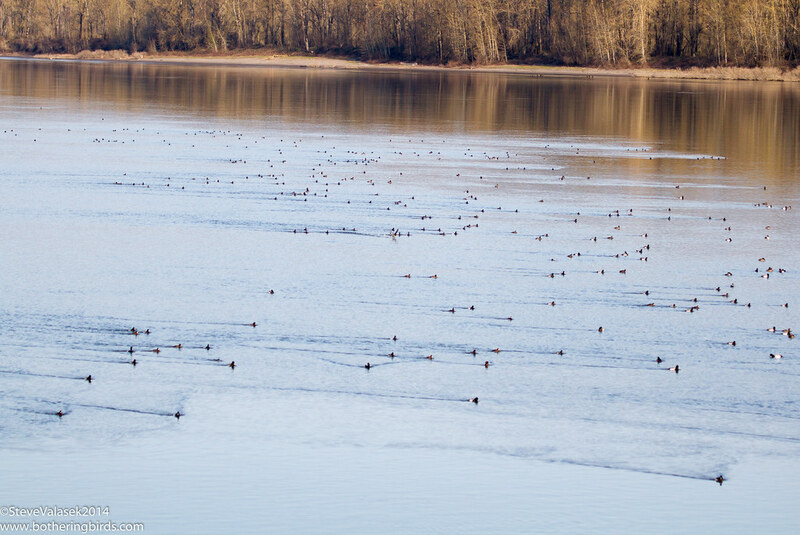 I made a few more stops on Sauvie Island. I got to see some awkward neighbors, an amazing Great-Blue Heron rookery. And not more than a hundred feet away was a Bald Eagle nest (you can just make out the female on the nest). 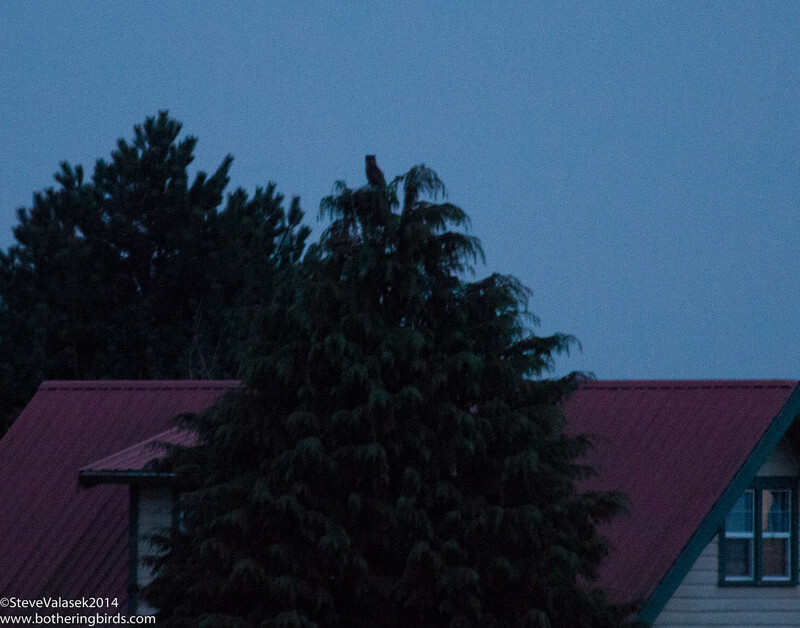 Soon after I saw my first Turkey Vulture in Oregon (I had seen a bunch in California on my move up the coast). I watched this American Kestrel fly up with a mouse in it's talons, here it is flying off after it was done feeding. I made one last stop on the island where I added a Golden-Crowned Kinglet and Red-Breasted Sapsucker to my day list. I then went into Portland to grab lunch, and a Rock Pigeon, and cruised out to the Portland Audubon Center. I knew that I could see Chestnut-Backed Chickadees and some Hummingbirds there. But I also got a Pacific Wren, who really wanted to be on my list. It jumped up and started singing to me. I was also hoping to finally see the one bird that I most wanted to see in Oregon, but hadn't yet, Varied Thrush. I got really lucky and got to see a pair of them under the feeders. Wow, what great looking birds. I was on a high after this point. From the Audubon Center I drove to Commonwealth Lake Park in Beaverton where I added Cedar Waxwings, Eurasian Wigeon, Pied-Billed Grebes, Lesser Goldfinches and a Brown Creeper to the list. There was a report of a Townsend's Warbler there, but none that I could find. I actually had a Red-Tailed Hawk fly up into a tree about 10 feet from me. But I didn't have my camera with me! It was getting dark and there were lots of kids around the lake and I don't like to bring my camera into that kind of place. Parents give me weird looks. I'm pretty sure that I also heard a Virginia Rail, but I don't list birds that I only hear, yet. But time was running out. I made one last stop at the Tualatin Hills Nature Park were I got to add Bewick's Wren and a lifer Hutton's Vireo to the list. I was hoping for Pileated or Hairy Woodpecker but no luck. I also didn't hear or see any owls there or at my apartment complex. But I finished the day with 76 species and a handful of lifers: Dunlin, California Quail, California Gull, Hutton's Vireo and Varied Thrush. And that was with no Accipiters or Nuthatches and just a few types of gulls. I bet that I could have had a hundred with some planning and a shorter lunch break. 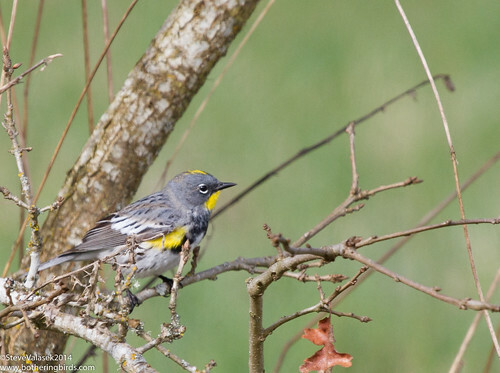 I'm hoping to get down to see a Yellow-Throated Warbler near Salem and out to the shore soon. I'm sure that if House Stark had a motto like that, they may have been a bit more cheerful. But spring is certainly in the air here in Oregon. It actually stopped raining on Monday and the Sun has been out for 2 days in a row! And I finally got to see Mt. Hood (or Mountain Hood as my daughter calls it), it's impressive and I really want to go visit before we leave. But the nicer weather let my son and I go looking for a Rusty Blackbird in Hillsboro on Tuesday. Behind one of the branches of the Hillsboro Library, which is huge and has their own donut/coffee shop, are a series of lakes and trails known as the Dawson Creek Corporate Park. As far as I can tell, it's private property which is open to the public. It really is a nice area with lots of various habitats and thus, lots of different birds. We had 31 species in just a few hours and didn't make it to every corner. But the main reason that we visited was to see a Rusty Blackbird which has been continuing there all winter. It's fairly rare for the Pacific NW, and everywhere else. They may even be on the path to extinction, their population has declined 85% since the 1990s and the Audubon Society has started a program to track them. So if you are reading this out East, go look for some. But alas, I only got a quick glimpse of the bird up in a tree before it flew off, no time for a photo, but I plan on going back next week. There were lots of Brewer's and Red-Winged Blackbirds around too. Walking around the ponds we got to see lots of ducks, Ring-Necked Ducks, Lesser Scaups, Mallards, Buffleheads and even some Wood Ducks. There was a lonely Killdeer there too. I keep hoping to see a different Plover, but these guys are so fun to watch. And I don't think that I've ever noticed the red-ring around their eye before. The different types of habitats in the park gave me a good look at an Acorn Woodpecker, first one in Oregon for me. But I would end up seeing a few more before we left. There is a colony in one part of Dawson Creek Park that we didn't get to. These Northern Flickers appeared to be getting ready for spring too. They were making some calls and one was following the other from tree to tree. This is one species that I see much less of in Oregon than I did in New Mexico. There were quite the number of Cackling Geese in a field opposite the lakes from the library. I estimated 800, but there could have been a thousand easy. I noticed a few with white rings around their neck and reported them as the Aleutian type. It seemed odd that there would be a group of ones that looked like that all together in the middle of the Minimas. But all of a sudden they took to the air at once and I got a flashback to the Festival of the Cranes fly-out at Bosque del Apache. My son got really scared and I had to hold him while they flew over honking away. But we shortly saw the cause of the commotion circling a bit north of us. This is cropped a bit, it was way out there doing some lazy circles. I also saw an American Kestrel and a pair of Red-Tail Hawks that were flying together. We also got to see a nice non-bird that I didn't think that I'd see in the "wild". A few weeks ago I saw a River Otter at Commonwealth Lake Park, and on Tuesday we saw 2 of them at Dawson Creek. I'm not sure what these Mallards were doing, but they were following this one pretty closely. Now that I think about it, some Gadwalls were following the otter that I saw before. I plan on heading back again to try and get some photos of that Rusty Blackbird, and it's a really nice place to spend a morning. It's amazing to think that we've already been here a third of our time and are moving on in 2 more months. I really need to see a Varied Thrush before then.